Not much time for posting on the blog as we have been pedal to the metal scouting for our tour in Colorado and then working with the group that came in on Monday. We have wonderful conditions and a good group of folks. 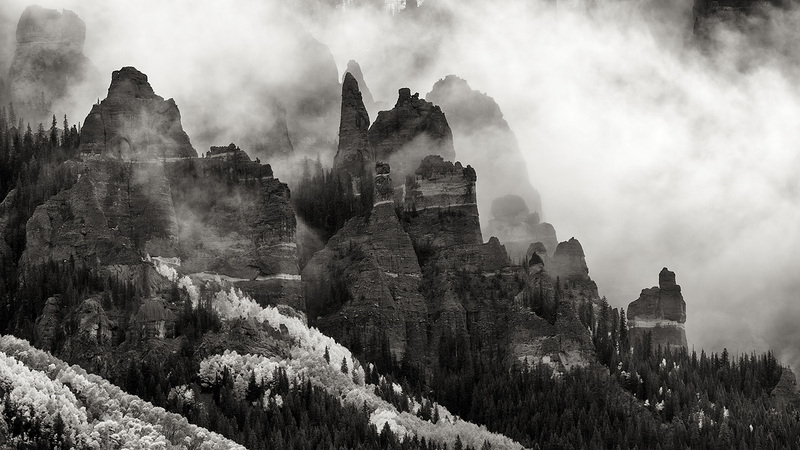 Today’s blog image is from the Owl Creek Pass area. It was raining during the entire ride up to this location. In fact it was said at one point, “this is kind of useless, maybe we should head back down.” And then as we approached the pass, the sky seemed to be lightening up a bit. Then as we reached our destination this is what we found! Needless to say we scrambled for our gear to capture this as quickly as possible before it faded away. Beautiful B&W! It’s good you didn’t head back down. Weather at altitude in Colorado can change very quickly. There should be some wonderful fall color this time of year. I’m looking forward to more Colorado blog posts as you get time.